I woke up this morning to dreams of summer and Paul Bunyan doughnuts. Warm, dense, and delightfully spiced these buttermilk confections have been making mouths drool for decades in the Northwoods of Wisconsin. The opportunity to enjoy a fresh made doughnut at the cook shanty may be months off, but my desire to attempt to recreate this classic was today. 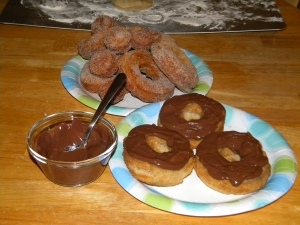 Get out your cast iron skillet and throw healthy breakfast concerns out the window, today we make doughnuts! Time to Make the Buttermilk Doughnuts. Posted in Yummy in the Tummy and tagged baking, Buttermilk Donuts, cooking, donuts, food, homemade, jennerific blog, Northwoods, Paul Bunyan, postaday, yummy in the tummy. Bookmark the permalink.